Simple Tool Management & Tracking. A Modern Approach to Tool Management. Tool Management doesn’t have to be difficult. Changes in technology have opened the door to new and easier ways to track tools. Contractors spend a considerable amount of money on small tools each year. Most direct spend is in replacing items that were lost or stolen. However, the larger cost to a company is often the project delays that occur when a tool isn’t on the project when needed. The reason many contractors struggle to effectively manage small tools is they take the wrong approach to the problem. Generally, companies attempt to manage tools by treating them as inventory and putting the warehouse manager in charge. The approach of treating tools as inventory blends inaccurate accounting with overly burdensome operational processes. This results in a tool management program that fails in both areas. The solution for companies is to stop mixing the field management and cost management components of small tools. These are two different problems and require two different solutions. Attempts to implement one solution for both problems is doomed to fail. Companies should employ a simple allocation approach to solve costing and billing issues with small tools. Modern accounting systems can easily allocate variable and fixed tool costs without billing each individual tool. With a bit of analysis and adjustment, an accounting team can assign costs and bill tool allocations very effectively without requiring additional effort from the operation’s team. Allocations can be tied to the revenue of the job, the labor usage or many other relevant factors. A simple status can even eliminate any tool charges to unique jobs that might not require tools. It is easier to tackle core operational concerns after separating the accounting issues from the operational issues. Operationally, a company needs to solve two problems. First, the company needs to know who is responsible for each tool in order to build accountability. Second, the company needs to efficiently get tools to the jobs where they are needed most. Technology can help with both of these operational problems. First, foreman can transfer responsibility for a tool when they hand a tool off to another field worker. Recording this transfer using a smart phone gives instant visibility to everyone. The warehouse manager no longer has to chase people around looking for tools. The office now has instant visibility into the entire tool inventory because it is updated in real time as tools move. Technology can help the second problem: Moving a tool from where it is idle to where it is needed. 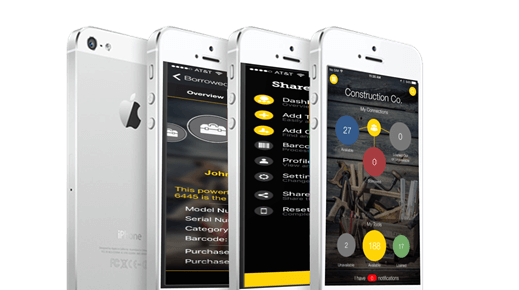 A foreman can search for a tool using the same simple phone app. Once found, a foreman can easily see which nearby project sites have the needed tool. With a couple quick taps of the phone the tool can be requested. A quick text and borrow is far easier than buying a new tool. The company saves money each time a tool is borrowed instead of bought. Office personnel save time when tool search and borrowing is completed by field personnel. Easy to use apps are changing construction in many ways. Why not have them also change how your company manages small tools? ShareMyToolbox was created to take advantage of mobile phones and cloud technology to solve small tool management in a new way. The goal is to keep tool management simple. To keep it easy. To move responsibility for tools out to field technicians, superintendents and foreman. This is where tools are lost. Thus, it is where tools must be tracked. Focusing tool management on the field just makes sense. For additional detailed information on the our tool management application please visit our Tool Inventory App page to learn more. More sales videos and demonstrations are available. Follow this link to learn more about the app.